VANCOUVER — It was the Sunday after Thanksgiving when Tommy Gaynor’s phone started blowing up. Gaynor, general manager of Gaynor’s Automotive, was hearing from folks who were reacting to an advertisement they had seen in the Sunday edition of The Columbian Newspaper. What confused Gaynor about that was the fact that he had no knowledge of placing an ad for his family’s business in the paper on that day. “I started getting text messages from friends and customers saying ‘that ad in The Columbian is amazing, I wish I worked at a place like that,’’’ recalled Gaynor, who immediately investigated the situation. Ad from Gaynor’s staff that ran in The Columbian Newspaper. Click to view. Gaynor soon found out that the 35 employees of Gaynor’s Automotive had scheduled their own ad, thanking and celebrating their employer, including Tommy’s parents — Tom and Holly Gaynor — who founded the business in 1986. It would be an understatement to say that Tommy Gaynor was moved by the gesture of his 35 employees, 13 of whom have been with Gaynor’s Automotive for at least six years. Tom and Holly Gaynor founded Gaynor’s Automotive in 1986. The couple had started with ownership of a gas station/convenience mart in Boise, Idaho but after moving to Vancouver, they purchased an automotive repair shop in Hazel Dell. Tommy, just 10 years old at the time, remembers that first shop as being quite modest compared to the four, state-of-the-art Gaynor’s Automotive locations today. In 1992, the Gaynors opened their second location (Salmon Creek). The downtown Vancouver location was next in 2000 and the Cascade Park location followed in 2007. In 2015, they partnered with Mike Jenkins of MAJ Development to upgrade the Salmon Creek location and expand the 5-acre site to include a Starbucks, Sherwin Williams Paint store, Banner Bank branch and Fred Meyer gas depot. Each month, 1,600 vehicles are repaired at the four Gaynor’s Automotive locations. “I really think it comes down to our core values, our principles and how we go to market,’’ Tommy Gaynor said. “It’s literally in our core values that we want to provide you safe and reliable transportation to make sure you have a safe ride home because your car was repaired properly. Over the years, including 2017, Gaynor’s Automotive has been voted Best in Clark County by customers in The Columbian Newspapers’ annual survey of the best area businesses. 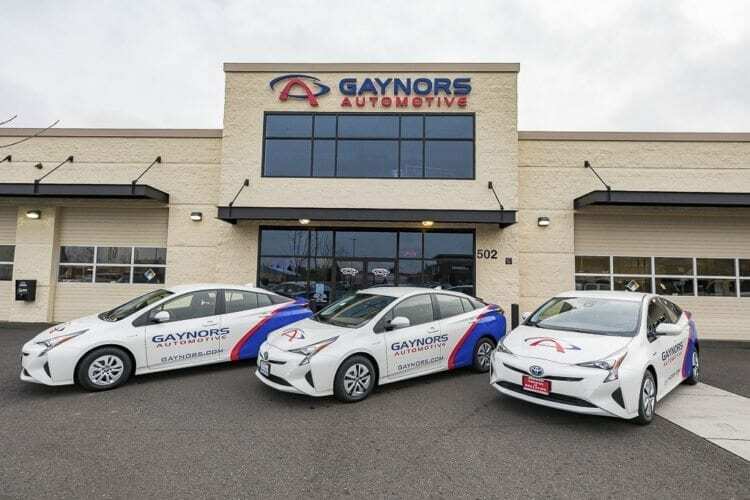 One of the reasons for the success of Gaynor’s Automotive is that over the years the business has been able to adapt to changes in automotive technology and Gaynor and his staff continue to do just that. Gaynor’s Automotive recently purchased three new Toyota Prius vehicles to replace its shuttle fleet. It’s part of a vision that Gaynor has for the future of the business. “As I look at the situation, I’m 42 years old and I know I’m going to be here another 20 or 25 years,’’ Gaynor said. “I try to do my best to stay in front of, or on top of, what’s going on in the automotive world. I think over the next 25 years, our society will be making a fairly aggressive shift to hybrid or electric-powered vehicles. The Gaynor’s Automotive commitment to keeping up with that technology is even much more substantial than the purchase of the three vehicles. In March, Gaynor is sending half of his tech crew to Seattle for hybrid and electric vehicle training. He is also in the process of purchasing $50,000 of specialty equipment for each of the Gaynor’s Automotive locations. From Day 1, Gaynor says fleet services has also been a key element to the Gaynor’s Automotive success. The staff, led by Fleet Service Manager Kevin Weisner, currently services the fleets of such area companies as Comcast, Charter Communications, AT&T, PeaceHealth Southwest, Beacock’s Music, and Commercial Dishwasher. Gaynor’s Automotive has put together an extensive program for fleet service that individual companies just can’t match. “It really comes down to technology,’’ Gaynor said. “Twenty years ago, fleets could have a shop mechanic, but even that title is now outdated. Our people are technicians. The majority of what our guys do is computer diagnosis. There isn’t a lot of rebuilding or repairing. But the Gaynor’s Automotive value doesn’t end with a quick turnaround. As part of the fleet service is a customer retention management system that tracks all completed and upcoming maintenance for each vehicle that Gaynor’s manages, whether that vehicle is part of a fleet or just an individual. To schedule an appointment or for more information, including phone numbers and addresses of the four Gaynor’s Automotive locations, visit www.gaynors.com.